"We dont need coastal votes for us to win and the world will continue also." Says President Kenyatta. - Bana Kenya News, Real African Network Tubanane. Home featured "We dont need coastal votes for us to win and the world will continue also." Says President Kenyatta. "We dont need coastal votes for us to win and the world will continue also." Says President Kenyatta. The NASA leaders answered the president about the activities and exchange of words that happened yesterday between the Mombasa governor and the president. Siaya senator James Orengo said that the president has moved a notch higher and engaging with governors in the public shows low self-esteem. "The President has no mandate to exclude people because he is the head of the country. No president in the world insults other leaders. According to the NCIC regulations, the president needs to be arrested and taken to court." Says ODM chairman John Mbadi. The opposition has erupted following the abusive techniques used by the president in Turkana and Mombasa. "The president has no difference between him and the Majority leader Adan Duale." says political analysts. "The world will continue if you will not give us your votes. That man should not take people for granted. (Mbona tufatane fatane kwani mimi ni bibi yake!! )Why is he to follow me every time, I'm not her wife. " 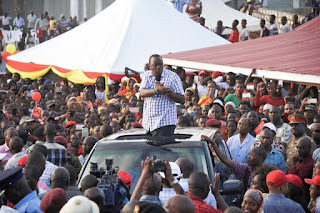 President Kenyatta answered Mombasa Governor Hassan Joho. "We don’t need Mombasa votes in order for us to survive. " This is the statement which started in Turkana. The president was confronting the Turkana governor Josphat Nanok. He labelled the governor 'shetani mshenzi' (foolish devil) while defending himself against allegations by the opposition that his government was determined to take large chunks of the proceeds from the oil. Is the President out of self-control and forgetting that he needs to be an example to the other leaders? Is this the president we voted in 2013? The president abusive and angry comments follow at Mariakani when he was opening a Jubilee office. "We don’t need your votes for us to win the elections," said President Uhuru.